First power from the floating wind farm project offshore Kincardineshire, Scotland began flowing in September, clearing the way for the full 50 MW build-out of the project by 2020, Kincardine Offshore Windfarm Ltd. (KOWL) confirmed. Principle Power said its WindFloat floating wind turbine foundation has been chosen for the project. 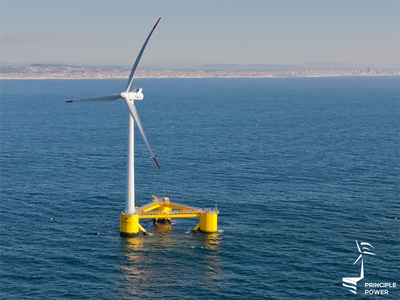 The WindFloat foundation allows offshore wind projects to be sited in locations with the most abundant wind resource, independent of water depth. Principle Power has also introduced new installation and O&M methodologies that reduce risk, cost and environmental impact. “This project clearly demonstrates the WindFloat’s ability to meet project needs, and how floating wind can be attractive to project developers in Europe and around the world,” Metelo said. In addition to the Kincardine project, Principle Power is executing on other projects ranging from 25 to over 100 MW elsewhere in Europe, Asia and North America.